Here’s a 60 FON. The letter is the year T for 58, S for 59, R for 60 and Q for 61 and then they stop. 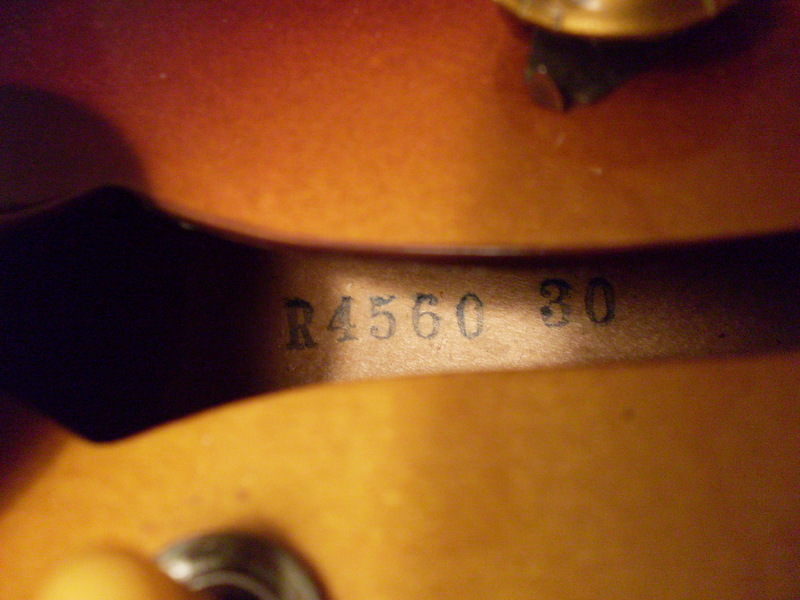 The number that follows is a three or four digit number and that designated the “rack”-usually 30-40 guitars. The last number is the “rank” or the guitars number within the rack. Confused? From 58 to 61, there was both a serial number and a factory order number for all 335’s, 345’s and 355’s. FON’s existed way before 58 but since 335’s didn’t, we’ll look at only those 4 years. There is no debate that, in general, a 59 335, 345 or 355 is worth more than any other year, assuming the condition and originality is equal. Usually, the FON and the serial are from the same year. But not always. So, how do we assess the value of those guitars that have a factory order number from one year and a serial number another? I recently bought a J200 for a client that was advertised as a 59. When I got it, I noted that the serial number was very early 60. 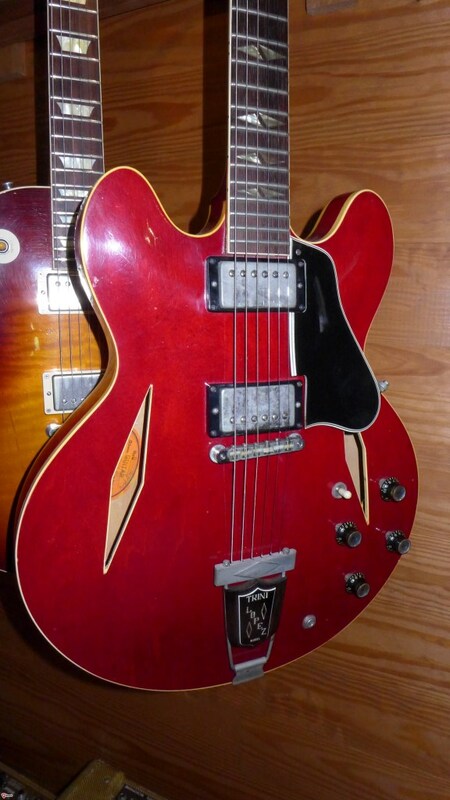 I currently have a 59 ES-335 with a 58 FON and I recall a blonde 60 345 with a 59 FON. One thing you won’t see is a FON from a later year than the serial. This is simply because the FON goes on the guitar first. 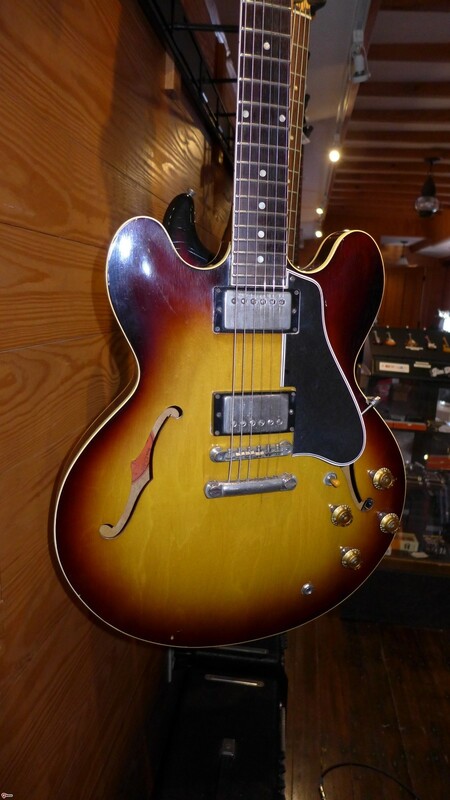 So, I have this 59 ES-335 with a 58 FON. That means it was built (or at least started) in 1958. It could have been completed in 1958 as well but there is no absolutely foolproof way to know for sure. But there are clues. It has the thin top of a 58, so that tells us that it’s got some 58 aspects. It’s got a pretty good neck angle-no thin bridge or shaving required-so that’s kind of a 59 thing but there were very late 58’s with that feature. The tuners are patent numbers rather than the patent applied tuners that nearly all 58’s had which leads me to believe that it was built in late 58 and assembled in 59. Why the completed body sat around from sometime in late 58 until April of 59 is a mystery. I had another 335 with a 58 FON that didn’t ship until August of 59. Maybe they built a load of 58’s and put them aside because Gibson was getting complaints about the cracks around the jack (typical of 58’s). Then, perhaps they were selling more than they could built in mid 59 and raided this cache of 58’s. I’ve spoken to a couple of Gibson employees from the era but none could shed any light on this. My point is-do I consider it a 58 or a 59? It is to my advantage to call it a 59. But what about that 60 with the 59 FON? Again, I’m probably going to get more for it if I call it a 59. So, it works both ways. But you can’t have it both ways, can you? My hard rule is that I go by the serial number, i.e a 60 serial means it’s a 60 regardless of the FON. I’ll mention the FON in all cases if it’s different so I’ll list the guitar for sale as, say, a 1959 ES-335 with a ’58 FON. That’s about as honest as I can be. I’ve been compiling a FON database for a couple of years now and I’m still filling in some of the blanks before I post it. There are lots of surprises and ambiguities. It seems that the more I learn, the more confusing it becomes. I’ve never run a large manufacturing business, so I have little insight into the day to day operations of a factory. Especially a factory operating more than 50 years ago. I’m convinced that they worried less about paperwork and more about filling orders. I’ll post the database when I have enough information for it to make some sense because now, with around 130 entries (all 335, 345 and 355’s) it’s about as clear as mud. Feel free to continue sending me data-serial, FON, model, finish and configuration (stop or Bigsby). No names will be entered. This is an April 59 serial number 335 with the 58 factory order number T7281 24. I call it a 59. Tony Bacon’s just released 335 book. Fortunately, it won’t replace me as the “335 guy” but it’s a worthwhile addition to your guitar book collection. I would call it the best 335 book ever written. 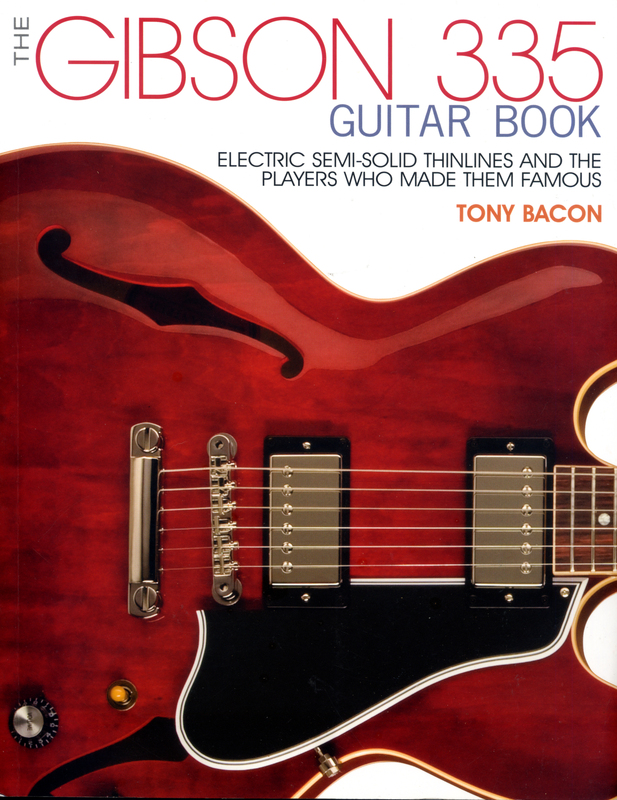 Tony Bacon writes a lot of guitar books and the very first guitar book I ever bought was one of Tony’s called “The Ultimate Guitar Book”. I was happy to hear he was writing a 335 book. I received a copy of the book a few weeks ago and was asked to not write about it until its release and, since it’s now available, I can talk about it. Bear in mind, I’m not a book reviewer. The beginning of the book is a history lesson-stuff that, if not for Tony’s vast knowledge of the development of the electric guitar, would likely be lost forever. He doesn’t dwell on the minutia that I lean towards but takes a more macro view of the 335 and it’s ancestry. I was flattered when he asked me to consult with him about the really fine details of the 58-65 era and the level of detail he goes into is satisfying without being too geeky. I’m happy that he left geekdom to me and my readers. But he doesn’t gloss over the fine details either. He presents the evolution of the 335 mentioning specific changes that made a real difference rather than every little detail. Big changes like neck angle and top thickness are discussed in detail but minor changes like who made the pots in what year and the other really geeky stuff I cover was, probably wisely, downplayed or left out entirely. I was particularly impressed by his knowledge of the other guitar makers and their products that either competed or influenced Gibson in its development and manufacture of the ES series. Who knew that Gretsch patented its stereo system in ’56 and that Rickenbacker’s stereo guitars were launched in ’58 a full year before Gibson came out with the 345 and 355 stereos? I don’t think there is a better guitar historian than Tony. Tony covers the evolution of the line admirably, hitting the high spots with regard to features, finish and early adopters. The fact that he even mentions the Argentine Gray finish gets kudos from me. Instead of completely separating the development of the guitar from the players of the day, he seamlessly moves from the evolution of the model to the back story of how ES players like Elvin Bishop, Justin Hayward, Ritchie Blackmore, Tony Hicks and lots of others (and largely British) artists came to appreciate these American icons. Following the ES timeline through the changes of the late 60’s and into the 70’s, ES players like Alvin Lee, Steve Katz (who was the very first customer in my shop when I opened in 2014) and, of course, Eric Clapton come into focus, all drawn to the versatility and gig worthiness of the guitar. And he doesn’t stop there. Tony follows the format of evolution and artist through every decade right up to the highly regarded Memphis 335’s available today. And, unlike me, he isn’t judgmental about it. I have no problem saying that most of the ’76-79 335’s I’ve played are less than stellar. He sticks to the facts and the book is probably better for it. After all, it isn’t a buyer’s guide, it’s simply the most comprehensive history of the line ever compiled in one place. And the photos. When folks ask me why I don’t write a book myself, my stock answer is that I don’t have the skills to shoot the photos that such a book would require. Tony’s photos define the guitar book genre. The guitars themselves are impeccably photographed and the historic photo content is a real pleasure to see. In fact, my biggest complaint about the “other” 335 book was the horrible photos. Tony’s photos are always totally professional and his choice of what guitars to feature is dead on (there’s even a Fender Starcaster). So, thanks, Tony, for all the great content. I don’t get the 335 reissue on the cover but at least it’s red. And that counts for something. Very early Trini Lopez Standard. This guitar had a few aces up its sleeve. Pickups are pre T-top with the purple windings like a PAF. It also had a zero fret which is just weird. Every time I buy a guitar, it comes with a surprise. It doesn’t matter if I get it from another dealer or from Craigslist, Ebay or The Gear Page. There is always a surprise. Usually, it’s an undisclosed issue and generally it’s a small one like changed saddles or the wrong bridge. Maybe changed tuner tips or spliced leads on the pickups or opened covers. Or missing PAF stickers or two repro knobs or a changed pot. There are a fair number of parts on a guitar and stuff gets swapped out over the course of decades. So, I generally accept stuff being wrong-or different than expected. It’s not generally because anyone is trying to cheat me. Its simply because most folks just don’t know the difference between a no wire ABR-1 and a wired one. And I don’t expect them to. I’m allowed to ask a lot of questions and look really carefully at the photos but somehow, something always gets by me. The good news is it cuts both ways. A really good example came to me recently off of Craigslist (the biggest crapshoot of all). The seller had a Trini Lopez Standard for sale. Now, I like Trinis although I rarely find the early ones that I prefer. The very first ones had a wide 1 11/16″ nut, all nickel hardware and pre T-top pickups. This one had some unusual issues but I bought it anyway – for a reasonable price. There was one issue I saw in the photos and that may have scared away some buyers. Someone had installed a zero fret which shouldn’t work properly without moving the nut which they didn’t. So, I figured, what the heck, I can simply remove it and fill the slot with some glue and rosewood dust. Well, oddly enough, the intonation seems fine, so I left it. 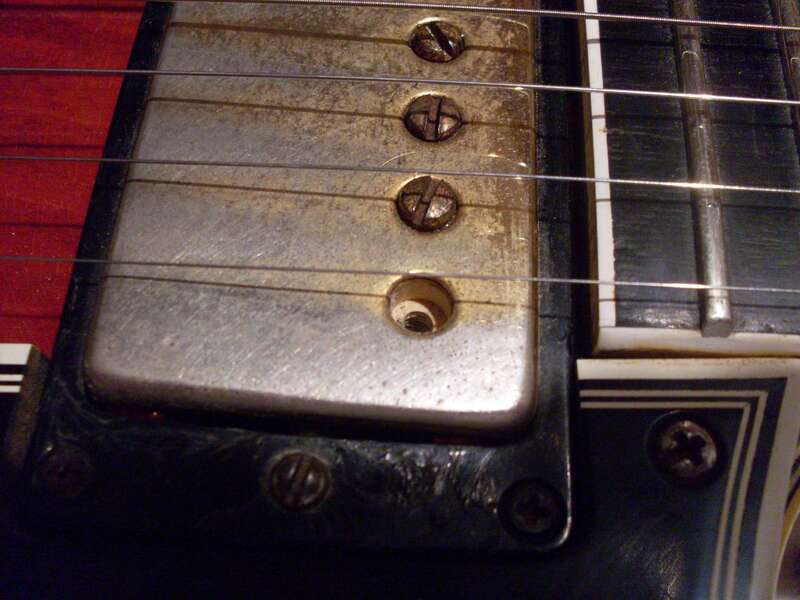 When the guitar arrived, the pickups had chrome covers. But the photos showed nickel. “WTF”, I said to myself. But the nickel ones were in the case pocket which was a relief. So, I decided to removed the badly soldered chrome covers and put the nickel ones back on. I know, from experience that this guitar should NOT have had t-tops. Regardless of what you read elsewhere, 65’s don’t have t-tops. They usually have the later poly winding pre T’s. Not this one. Both pickups had the coveted purple enamel wire. They were identical to PAFs. The pickups alone were worth the price of the entire guitar (almost). And yes, it’s pretty unusual to see these pickups in 65 but if the covers are nickel, the windings are almost always purple. Other good news, 64 date codes on the pots, nice wide neck, Brazilian board and the rest of the parts were nickel. Bad news? I had to buy a set of proper vintage strip tuners to replace the ill-fitting Schallers that had been added. And it plays great. I should point out that for every time I get lucky and get more than I expected, there’s another guitar with a rewound PAF or a repro stop tail or a back bow in the neck. You can always ask a lot of questions but when the 89 year old widow of the original owner is selling the guitar to pay for her nursing care, you really can’t ask her to pull the pickups to check the stickers or try the truss rod to see if it still turns. And I don’t (ask her, that is). It’s the crapshoot part of the business. It’s nice that it goes my way once in a while. Like the 61 ES-355 with the neck break, changed bridge, wrong tuners and a pair of double white PAFs. Christmas can come all year round. Always nice to find an undisclosed double white. It’s like your birthday and Christmas rolled into one.